The return of the No. 3 to the Sprint Cup Series is just one of the exciting changes Darrell Waltrip sees in the 2014 season. Before I get into my thoughts about the upcoming 2014 season, Stevie and I ask that you join us in praying for former F1 champion Michael Schumacher, who is battling for his life, following a head injury from a skiing accident. Michael, who will turn 45 on Friday, won 91 races and seven championships in his F1 career. We just ask everyone to pray for him. It’s about this time of year, as we get ready to head to our early January testing at Daytona, that folks start making their predictions for the coming season. It always goes along the same lines — the racing is going to be the most exciting we’ve ever seen — it’s going to be an incredible season – the championship chase battle is going to come down to the last race at Homestead. The reality is you hear it every year. It’s also said in all sincerity. It’s the hope of the future and hope of the season. Does it always play out just like that? No it doesn’t always. You just look at all the factors that are lining up for the coming year and you try and make your best estimate of what the new season is going to bring. For me, I really believe 2014 is going to be one of those Red Letter Seasons. I didn’t say Red Letter Day – I said Red Letter Seasons in our sport. I think if you take a look at all the changes for 2014, how can you not agree? Of course the biggest thing 2014 has on the horizon is the return of the No. 3 to NASCAR Sprint Cup racing. Going to Daytona in February and having the No. 3 back in competition with Richard Childress’ grandson behind the wheel is going to kick the season off right. There’s overwhelming emotion tied to the No. 3, Dale Earnhardt and especially Daytona. 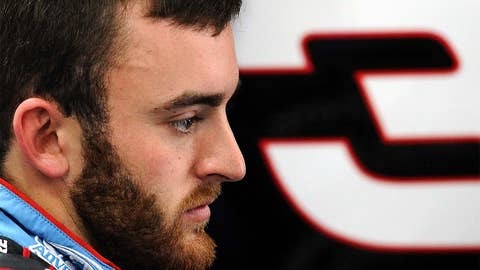 If young Austin Dillon can go to Daytona and even live up to half the expectations that folks are putting on him, well I just think it’ll be a great way to start off the 2014 season. In addition to the return of the No. 3, we will also see the return of the No. 4 to our sport. Morgan-McClure ran that number for many years but it too has been absent too long from our sport. Kevin Harvick will now be driving the No. 4 for Stewart-Haas Racing. He is one of two additions over there for next season. Kurt Busch is the other. Stewart-Haas will field four cars next year for the first time in its existence. How is that all going to work out over there? Ryan Newman is gone and now Kevin along with Kurt has joined the family. Oh by the way if that wasn’t enough, you have ol’ Smoke, Tony Stewart, recovering from his devastating injury that sidelined him. Tony’s rehabbing hard to try and be ready to go in time. He’s lost weight and looking good. Here’s hoping Tony can get that ol’ right leg well enough to hold that pedal wide open like he always has. With Kurt out of the No. 78, that opened the door for Martin Truex Jr. to move over there after leaving Michael Waltrip Racing. What that No. 78 bunch did this past season really changed the perception folks had about how to run a single-car operation while utilizing the assets you have with your alliance with a bigger organization. What the No. 78 did with Kurt behind the wheel and their alliance with Richard Childress Racing was to me the Cinderella story of our 2013 season. Think about it, that bunch made history this past season becoming the first single-car operation to make the Chase. That was unbelievable. I think it woke up a lot of people about the potential opportunities that exist by utilizing an alliance. I for one will not be surprised to see them replicate their success in 2014 with Martin behind the wheel. The 2014 season will see something like 31 or 32 cars aligned with each other in some fashion. Some folks believe that is a bad thing. I am not one of those folks. I say it’s a good thing. Just look what the No. 78 did. It raised the level of competition in our sport. It also gave hope for those single-car operations out there that they too can also have a chance. Another change for 2014 is a full-blown Rookie of the Year battle. This past season saw Danica and Ricky Stenhouse Jr. running for the title with Ricky eventually winning it. The 2014 race is going to have a lot more players in it. I already mentioned Austin Dillon in the No. 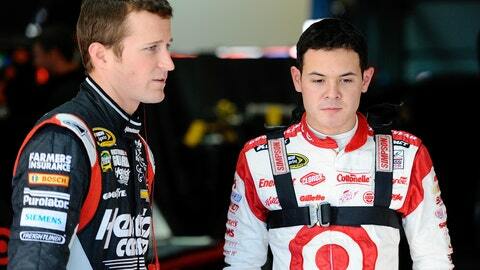 3, but you have Kyle Larson replacing Juan Pablo Montoya over at Ganassi’s. That kid has grabbed everyone’s attention from the moment he sat down in a stock car. With him and Austin, along with the handful of others, I think we will have one heck of a Rookie of the Year battle, which quite honestly, we haven’t had in a long time. One of the biggest things I am happiest about going into 2014 season is there aren’t major changes to the car. I mentioned last week or so that these teams have gone through two consecutive years of major changes. We now have a year under our belt with the Gen-6 car and two years under our belt with the fuel injection. The upcoming season is only bringing some tweaks and I know there are a lot of happy folks in those race shops over that. These tweaks and minor changes don’t affect the superspeedway races at Daytona and Talladega. However there now is a minor spoiler change for the superspeedway races. Last year NASCAR lowered the spoiler height and quite honestly I thought they overdid it. Those cars are a little shaky in traffic, so this coming season they are adding more spoiler back in there and I believe it will make the racing better. So just minor tweaks across the board and again, that’s a good thing. These teams now have a full year under their belt with the Gen-6 car. They have a baseline of what the car likes and doesn’t like. I’ve said it all year that there is more potential with this car. It’s just waiting for the teams to catch up to it. We had 19 track records and 17 different winners over a 36-race schedule. In addition to all this, there is Jimmie Johnson going for his history-setting seventh NASCAR championship. These are just some of the storylines to follow as we head into 2014. Who is going to be the best team next season? Obviously the benchmark is the No. 48 car. If you are going to win races, well you have to beat Jimmie. If you are going to win the championship, well you are going to have to beat Jimmie. The biggest threat standing in Jimmie’s way has to be Joe Gibbs Racing. All three of those Toyota’s will be potent contenders. Denny Hamlin should be back in fine form after his injury this past season. Winning at Homestead in November did a lot to get that No. 11 car pointed back in the right direction. Kyle is Kyle. Mr. Busch is a threat no matter what track we go to. One of the biggest things I am going to be watching for over at JGR is to see if there is the dreaded sophomore slump for Matt Kenseth. Matt had the best season of his career in 2013. Ironically it came as his first with JGR. That No. 20 car won seven races and was a contender for the championship. The key to watch is can they continue to ride the wave of emotion, energy and momentum they built this past season. If they can, then Jimmie is going to have his hands full trying to win his seventh championship. You can say the same thing about Joey Logano and the No. 22 team just like the No. 20 car. Joey made the most of his fresh start at Penske Racing in 2013. Actually with all the struggles that defending champion and teammate Brad Keselowski went through this past season, Joey was the bright spot at Penske Racing. The 2014 season will also close out ESPN/ABC’s run in our sport. NBC will return to cover NASCAR in 2015. I think we will see major changes when that happens not only in the race schedule but the races that make up the Chase. I don’t know that for sure, but it’s just something I can see coming with the new 10-year television package with FOX and NBC kicking off in 2015. This week is all about ringing in the New Year, college bowl games and the NFL playoffs begin. 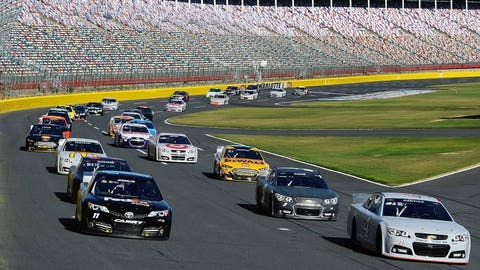 Next week it all really cranks up in NASCAR as we head to Daytona Thursday, Friday and Saturday for testing. You can catch all three days action on FOX Sports 1. It will be fun to get back down to Daytona and see everyone plus get the 2014 season moving forward.